Here's how the dress looks before the alteration. It has elastic shirring at the top and waist area. I decided to cut off the shirring on the top since I had to shorten the torso area to fit Kiddo. Set the cutout portion aside for later use. I eyeballed the dress and decided to take an inch and a half away from the top to bottom on one side. After taking in the sides, I reattached the top shirring and added elastic round the entire top. And that's that! I am done! Here's how Kiddo looks in the dress. 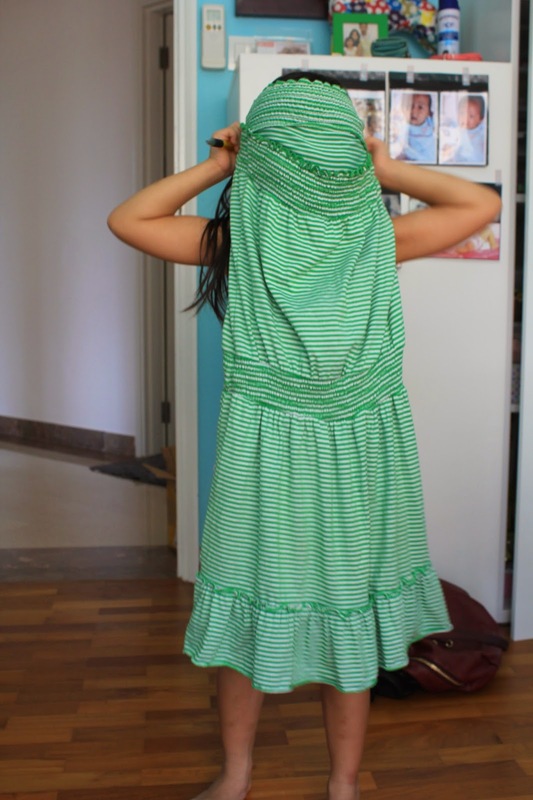 She wanted it to be a long dress, so I made it into a midi. A long dress would be too cumbersome on a kid.